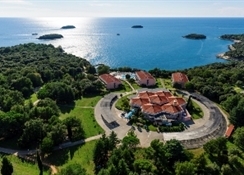 Resort Funtana, Pula offers all-inclusive options with a wealth of activities and a breath-taking sea front location for all types of travellers to enjoy.Families are well catered for with a packed programme of activities for 4 ¿ 11 year olds in the supervised mini club. Younger guests also benefit from their own beach area which is furnished with child friendly loungers and parasols. They can enjoy a dip in their own swimming pool have an outdoor play ground. Each of the 228 rooms are spacious and comfortable with an en-suite bathroom, air conditioning, telephone, safe facilities, hairdryer and balcony.